TURKISH PRESIDENT RECEP Tayyip Erdogan has declared a three-month state of emergency, vowing to hunt down the “terrorist” group behind last week’s bloody coup attempt. He has accused followers of his arch-enemy, US-based cleric Fethullah Gulen, of being behind the coup, which has led to a wave of some 50,000 arrests and sackings of suspected conspirators. 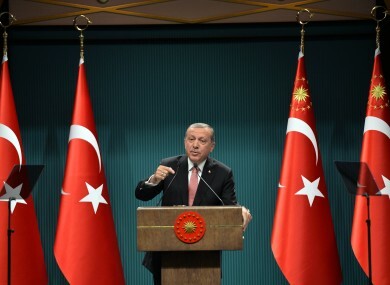 The state of emergency was needed “in order to remove swiftly all the elements of the terrorist organisation involved in the coup attempt,” Erdogan said at the presidential palace in Ankara. Although the special measure vastly increases state security powers, Erdogan vowed there would be “no compromise on democracy”. The announcement followed long meetings of Turkey’s national security council and cabinet chaired by Erdogan at the presidential palace. A state of emergency gives the government extra powers to restrict freedom of movement, said an official, adding that it would not restrict financial or commercial activities as “international law sets limits of restrictions”. In 2002, Turkey lifted its last state of emergency, which had been imposed in provinces in the southeast for the fight against Kurdish militants in 1987. Global concern has grown as Turkish authorities have arrested or fired troops, police, judges, teachers and other civil servants in the aftermath of Friday’s failed bid to seize power by rebel troops. Earlier the Turkish leader lashed out at critics of the sweeping purge, telling France’s Foreign Minister Jean-Marc Ayrault — who had warned Erdogan not to use the failed coup as a “blank cheque” to silence his opponents — to “mind his own business”. “Does he have the authority to make these declarations about my person? No, he does not. If he wants a lesson in democracy, he can very easily get a lesson in democracy from us,” Erdogan said on al-Jazeera. Earlier Wednesday US Secretary of State John Kerry said that while “we condemn this coup”, it was important that the response to it “fully respects that democracy that we are supporting”. And German Chancellor Angela Merkel’s spokesman, in more direct comments, said that in Turkey “nearly every day we are seeing new measures that flout the rule of law and that disregard the principle of proportionality”. Erdogan in the Al-Jazeera interview insisted that the arrests and suspensions had been carried out “within the law”, adding that “of course that does not mean we have come to the end of it”. Erdogan was in the Aegean resort of Marmaris when the coup struck. Narrowly escaping the rebel soldiers, he flew to Istanbul where he had stayed since, appearing before huge crowds of flag-waving supporters several nights in a row. Turkish authorities have launched an operation to find 21 commandos who are suspected of the attack on Erdogan’s hotel. If I stayed (in Marmaris) 10, 15 minutes more, I would either have been killed or kidnapped and taken away by them. The putsch left more than 300 dead and caused scenes of devastation, especially in Ankara where fighter jets and attack helicopters turned parts of parliament and the police headquarters to rubble. Erdogan admitted there had been “intelligence failures,” saying he had learnt about the coup from his brother-in-law. The government has since cracked down hard on alleged rebel soldiers, formally arresting 99 of 118 detained generals and admirals, and also placing in custody thousands of troops, with some later seen bruised and wounded. Ankara says the coup was masterminded by Gulen and the massive crackdown appears to be targeting individuals suspected of any connection to Erdogan’s former-ally-turned-foe. Turkey has stepped up pressure on Washington to extradite him, sending several “dossiers” it says are packed with evidence about his alleged involvement. In their first telephone conversation since the attempted overthrow, President Barack Obama pledged US assistance to Erdogan for the investigation into the putsch, which has threatened to once again raise tensions between the uneasy NATO allies. Gulen issued a statement on Tuesday urging Washington to reject the extradition call and dismissed as “ridiculous” the claim he was behind the botched coup. The 75-year-old reclusive cleric lives in Pennsylvania but retains vast interests in Turkey ranging from media to finance to schools and wields influence in various arms of the state, including the judiciary and police. The Gulen organisation has another superior mind, if you will, and the time will come when those connections will be deciphered. Email “Three-month state of emergency declared in Turkey ”. Feedback on “Three-month state of emergency declared in Turkey ”.